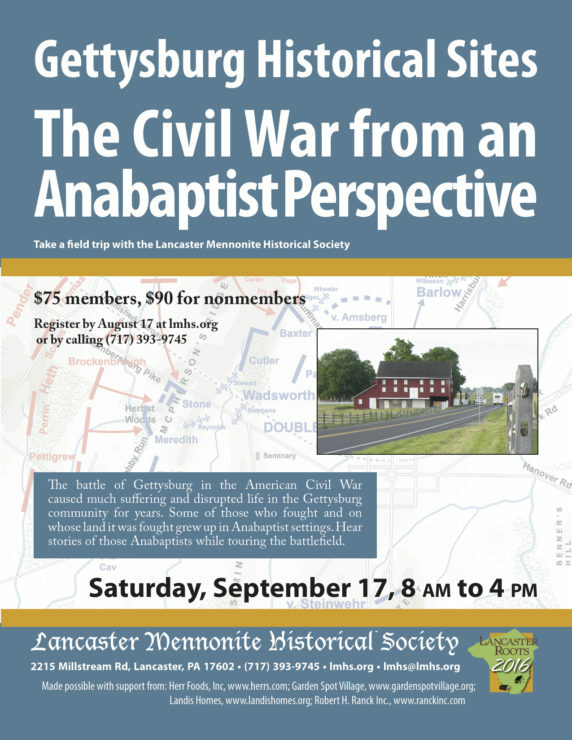 On September 17, the Lancaster Mennonite Historical Society is sponsoring a field trip to historical sites in Gettysburg, PA, featuring discussion of the Civil War from an Anabaptist perspective. The tour will be led by Kevin Lay, a Brethren in Christ pastor. The details are below, reprinted from the newsletter of the Lancaster Mennonite Historical Society. The American Civil War was a divisive time. Not only were families split apart, but so were churches. With the introduction of drafts and expectations of neighbors to fight, those of Anabaptist witness had to make hard choices. Should an Anabaptist pick up a gun and fight? Should they run and hide? Should they stay home and face ridicule, arrest, and in some cases death? What about soldiers who were shocked by the violence and turned to a way of peace during their time in the Army? The Lancaster Mennonite Historical Society’s tour of Gettysburg from 8 am to 4 pm, Saturday, September 17, will reveal the difficult choices that some Anabaptists made during the Civil War. The tour will visit the major sites of the battlefield—Devil’s Den, Little Roundtop, and more—discussing the personal stories of soldiers and the greater strategic fight. But the trip will also walk the property of Joseph Sherfy, pastor of a local Church of the Brethren whose home was ravaged by war. It also includes locations where Anabaptists chose to fight. Lay has served as the pastor of Mount Tabor Brethren in Christ Church in Mercersburg, Pa., for nine years. He is a graduate of Messiah College and Eastern Mennonite Seminary. He and his wife, Kimberly, have two daughters aged seven and five. Kevin became interested in the Civil War through visits to Gettysburg and other battlefields with his father when he was younger. The struggle for peace in the midst of war and the challenge of allegiances has always fascinated him. Registration for this battlefield tour is due August 17. Tickets cost $75 for LMHS members and $90 for nonmembers. Reserve your spot online at lmhs.org, or by calling (717) 393-9745. The field trip departs and returns from the Lancaster Mennonite Historical Society’s headquarters, 2215 Millstream Road, Lancaster, Pa.